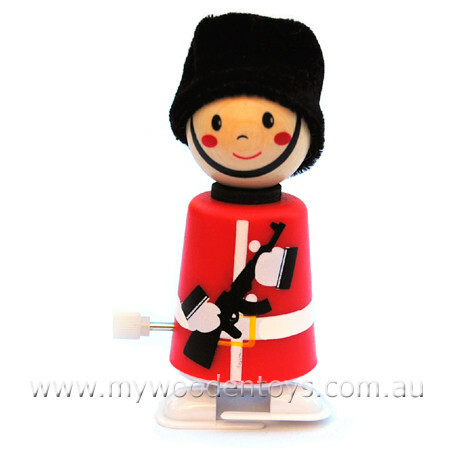 Wooden Wind Up Clockwork Soldier is a sweet colourful little clockwork Grenadier Guard with a wooden head and furry material Busby (hat). This clockwork soldier has a well made plastic body housing the clockwork motor. This is a great little toy and combines wood, plastic and clockwork in clever way creating a really fun toy. Size: Soldier is 9cm tall. Material: Wood with child-safe paint, Plastic body, Clockwork parts. We like this because: "Lovely little soldier with a furry hat."